Michael Buckner/GettyRichard Branson looks for people who will fit in with his company’s unique culture. 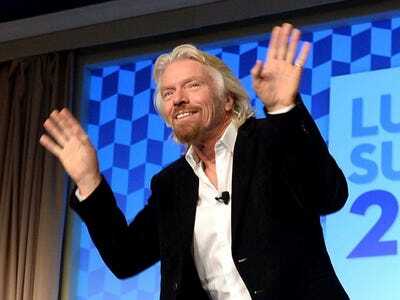 Billionaire business magnate Richard Branson is extremely successful. And at least part of that success can be attributed to the strong teams he’s built. Jas Singh, a recruiting director at Iopa Solutions, says in a LinkedIn post that when building those teams, Branson cares more about a candidate’s personality than their skillset. “Nearly every person mentions how [Virgin] spends extra time and effort getting to know candidates compared to other companies,” Singh says in the LinkedIn post, which takes a close look at Branson’s success. While skills can be learned, it’s important for Branson to find people who will fit in with Virgin’s entrepreneurial culture. Branson keeps his teams small, spinning off any division that gets too large into it’s own company, Singh says. “Smaller teams promote a flatter and more flexible management structure,” he explains. Virgin also encourages employees to pursue their own ideas within the company. “This gives ambitious new hires the belief that they can make a genuine impact to the overall organisation,” Singh says. In a company that’s constantly evolving and changing, it makes sense that a candidate’s personality would make the biggest impact on the hiring process. Finding employees who are adaptable and innovative will contribute far more than those that simply have a finite set of skills. “Core to [Virgin’s] success are the right people,” Singh says.